In the SAP world, there are myriad moving parts. Regardless of the kind of implementation you have, On Premise, in the Cloud, or Hybrid, there are an incredible number of technologies, services, support issues, and scenarios about which you need to be aware of. What’s the best way to learn about all of these things, and keep your fingers on the (technical) pulse of SAP? Enter the Meet the Expert (MTE) webinar. 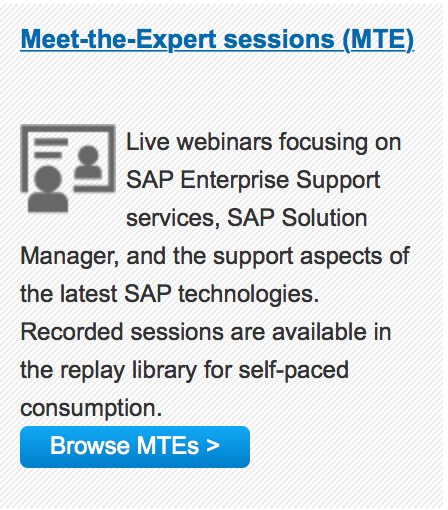 MTE sessions are designed to provide Enterprise Support customers with the means to learn about support and product-related topics, in an online webinar format, hosted by an SAP professional in that particular topic. For example, if you are interested in learning more about the new SAP One Support Launchpad, or how to prepare for a Unicode Conversion there is an MTE for you. Meet the Expert sessions are delivered in two ways: Live and Recorded. In a live session, webinar participants register for an event on a particular date/time, and are able to ask questions of the presenter during the Q&A session. However, If you’re not able to join, live sessions are recorded, and available for replay on your schedule. MTE sessions are scheduled for all regions globally, and in a variety of languages. There is also no limit to the number of live or recorded sessions you’re eligible attend, so make sure you take advantage of anything that sounds interesting. Meet the Expert sessions are available as part of your Enterprise Support, Preferred Care, and PSLE agreement through the ES Academy. This site is your one stop shop for the consumption of all support related items. Here, you can learn which support items are relevant to you, based on your role, your software lifecycle stage, or how you’d like to consume the material, just to name a few. If you would like to learn more about the various Meet the Expert sessions that are available to you in a live, or recorded, format simply log into the ES Academy, or take a look at the document linked here. When you find something that interests you, each session has a link to either register for the session, or view the recording. It’s as simple as that!